MOSCOW, March 20. /TASS/. Russia’s modernized Mi-28NM attack helicopter will be fitted with a new guided missile with a range of more than 25 kilometers, an aircraft industry source told TASS on Wednesday. "A new missile, codenamed ‘Article 305,’ is being designed for Mi-28NM. It is intended to destroy armored vehicles and reinforced concrete fortifications in daytime and at night. The range of the missile will exceed 25 kilometers," the source said, adding that one helicopter will carry up to four such missiles on each of its two pylons. Russian Defense Minister Sergei Shoigu told the State Duma (lower house of parliament) committee on defense on March 11 that new guided missiles with increased range have been developed for Russian attack helicopters on the outcomes of the military operation in Syria. "Thanks to our experience in Syria, our helicopters have received light multifunctional guided missiles with significantly increased range - up to 15 kilometers," the minister said. The first Mi-28NM helicopter was made in 2009. Being an upgraded variant of the Mi-28N Night Hunter attack helicopter, it differs significantly from its predecessor. The Mi-28NM onboard radar equipment comprises an innovative helmet-mounted imaging and pointing system. The helicopter is equipped with an N025 radar station, which makes it possible to carry out round watch. The upgrade also has a new EW system. 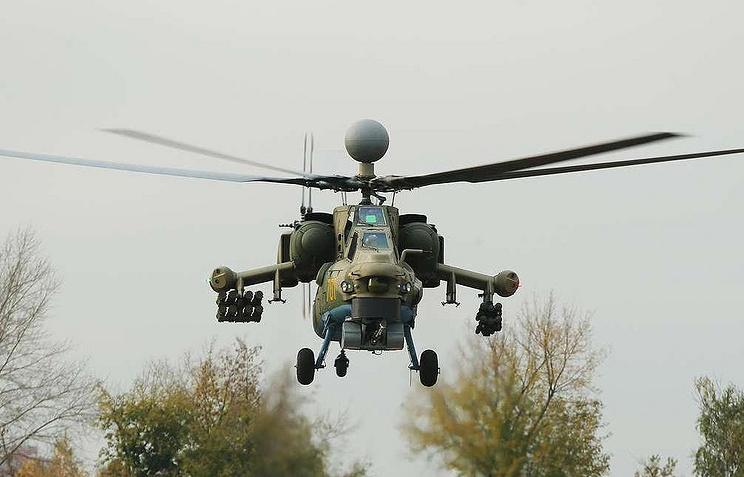 In addition to that, the Mi-28 NM helicopter has a modified fuselage and modernized engines; a radio-electronic onboard system and a target sight system; an auxiliary power plant and equipment for communication with unmanned aerial vehicles.